Laura Chasman, Andrea Sherrill Evans, Caleb Neelon, and August Ventimiglia are all featured in Time Flies: Two Years at Drive-By in Watertown, through August 25, 2012. Elizabeth Alexander‘s Still Life: a fabricator’s banquet will be installed at The Cape Ann Museum’s White-Ellery House in Gloucester, MA one day only (8/4, 11 AM-3 PM). John Cameron is exhibiting work through the New Hampshire Furniture Masters, first at Castle in the Clouds (8/12), then at the New Hampshire Historical Society (8/22-9/19, reception 8/23, 5:30-8 PM), plus more in Sept.
Cheryl Clark is reading in the Dog Day Poetry Marathon at Outpost 186 (event runs 8/17-8/19; Cheryl reads on Saturday). Cynthia Consentino is showing at Harmon Gallery in Wellfleet (thru 8/17). Kelley Donovan has launched a Kickstarter campaign to support her Third Life Studio Series showcasing new work by local choreographers. Vico Fabbris will be exhibiting work (8/28-9/7, reception 8/30, 4-6 PM) at the Truro Center for the Arts at Castle Hill, where he’ll also be teaching a painting course. Perry Glasser has reached an agreement with publisher Outpost19 to publish his collection of memoirs, entitled antimemoirs. His novel, Riverton Noir, is scheduled to appear from Gival Press in October 2012. Wendy Jehlen‘s The Knocking Within will be part of FringeNYC (8/11-8/17). Mariko Kusumoto‘s traveling exhibit has returned from FL, back home to Mobilia Gallery in Cambridge. Scott Listfield has a painting in Gallery 1988‘s Crazy 4 Cult at a pop-up show in NYC (8/9-9/1). And, his painting was recently featured on the cover of Boston’s Weekly Dig. Suzanne Matson published a new story, “Ultraviolet,” at Mussoorie Writers. Also, see Suzanne’s profile at the NEA’s Writers’ Corner. Mary Bucci McCoy has an article in the July/August ‘2 edition of Art New England. D.K. McCutchen won Honorable Mention for a Speculative Literature Foundation Older Writer’s Grant for her manuscript Jellyfish Dreaming. Also, she’ll read from her nonfiction book Whale Road at the Authors Booth of the Heath Fair, Heath MA (8/19, 10:30 AM). Liz Nofziger collaborated with Linda Price Sneddon to create Shape of Community, a collaborative installation in commemoration of the 100 year anniversary of the Bread and Roses Strike of 1912, at Essex Art Center (thru 8/16). Monica Raymond is in the poetry anthology Before There is Nowhere to Stand, and she’ll read from it at Bluestockings Bookstore in NYC (8/13, 7 PM). Her play Virtual had a staged reading at Theater One in Middleboro, and in June, she participated in the Theater and Civil Society seminar at Brown University. Peter Snoad‘s short play, Perfect Strangers, has been published by Heuer Publishing. The play, performed at the 2010 Boston Theater Marathon, won the 2012 international short play contest at the Stratford Fringe, in Stratford-Upon-Avon in the U.K.
Mary Sullivan Walsh has published a new YA novel, Dear Blue Sky (Penguin). Debra Weisberg‘s paper and tape works will be exhibited at the Paper Biennial Rijswijk 2012 (9/2-11/20). 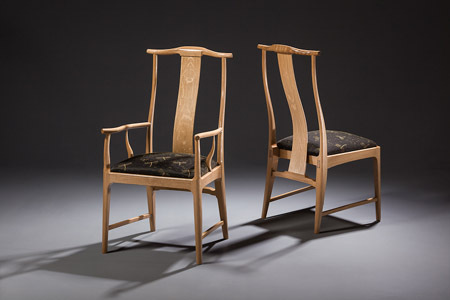 Image: CRANE CHAIRS by John Cameron.